Born and raised in Maryland, Donna West spent her adult life working as a Registered Nurse at a state hospital. An accident in 2002 ended her adult working life and sent her back to her childhood, where she could stay home all day and play with her needle and threads. In 2014 she was transplanted to the beautiful mountains of East Tennessee with her husband. The view of the Great Smoky Mountains became her muse, and Smoky Mountain Stitches was born. A reproducer of antique samplers for now, she hopes to one day create her own designs. 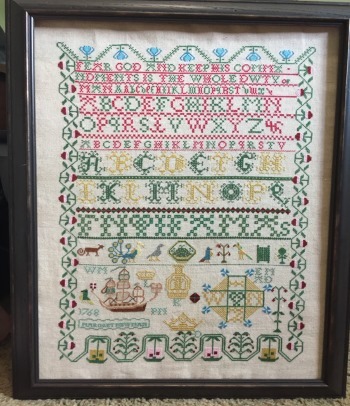 Donna from Smoky Mountain Samplers presents a great new reproduction sampler, Margaret Newman 1768, The row of birds is so fun, the colors are lovely and give this sampler a special touch.